In case you missed any of my posts over the weekend I thought I’d share them collectively for you right here along with a few other pics that haven’t been posted yet. If you see a link, click on it to enhance your blog viewing experience. Friday evening I performed at Penn State University supporting the talented Eric Hutchinson. It was a fun show, good crowd, and hopefully I made some new friends and fans. Since I became a dad my touring schedule has switched from a constant travel back and forth across the U.S., to being home most of the time and flying out to do a few one-off shows here and there. I’ve been okay with that simply because I want to be here for my son, especially during these early years. On the other hand I’d be lying if I said I didn’t miss performing as much as I used to, so it’s always nice to get back on stage these days. One-offs, to me, are like a 36 hour marathon race. As soon as you wake up early in the morning you’re off, non stop. First leg is getting to the airport, second is the flight, third is the layover and the other flight, then getting the rental car, checking into the hotel, getting to the show, so on and so on until you’re back where you started, home. I usually set my iPhone alarm for three different times, each serving a specific purpose. The first alarm goes off about 15 minutes before I actually get up. This is like a nudge just to say “Hey, you’re going to have to get up soon.” The second alarm goes off only 5 minutes later but allows my brain to get what feels like 30 more minutes of sleep. The third alarm is what I call the “parent alarm” because it reminds me of the last time your mom or dad would wake you up for school in the morning. “Get up RIGHT NOW or you’re going to miss the bus, I’m not telling you again!” So, three alarms, I’m good with that. Now, the process of getting through the airport and actually getting on the plane is going to have to be another blog at some other time. There’s way to much to complain about and criticize. I’m only saying this as a professional traveler, so if you don’t fly very much you probably haven’t noticed the inconsistencies from one security line to the next. Either way, I’ll save it all for a stand up comedy routine like everyone else with strong opinions on airport travel. Once I got checked in and settled at my gate I made this Vine. Obviously I was bored, but at least I got to share it with the entire world. I had a quick layover at Washington Dulles airport. The second plane was what you’d call lil’. It was a lil’ plane with very lil’ space to relax. 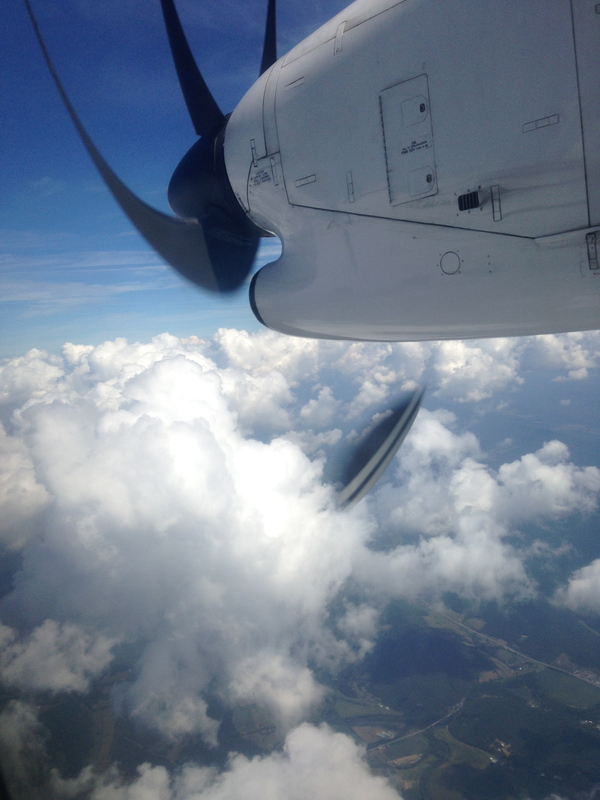 Interestingly enough, during the flight while taking “I’m bored on a small plane” pics, I found out looking through the screen on my phone that the propeller blades became warped. I think this was from a combination of the camera’s capture speed and the curve of the plane’s window, but, it looked weird enough so I snapped a shot of it for you (seen left). You can thank me later for blowing your mind. Once we landed I went to pick up my rental car. I have to say, never once have I reserved a compact car and actually received a compact car. I’m always told “We’re out of compact cars at the moment so I’m going to upgrade you at no extra charge.” I guess I’m supposed to be like “Oh thanks, that’s nice of you,” but this happens ALL the time. Maybe I don’t want a bigger car, maybe I just want what I asked for. What if psychologically I couldn’t handle a bigger car? What if I was a short person who felt more comfortable in a smaller size vehicle? These are not really the issues, but you don’t know me car rental place, get your act together and get me what I reserved; a vehicle with no automatic locks, no CD player, and a weird dent on the driver side door that I have to take note of so you don’t charge me for it upon return. I mean, come on. So, I checked into the hotel. This is the point at which I usually restring my guitar, warm up, make the set list, and eventually make my way to the venue. I utilized my Vine account once again to make this action packed video. Side note, it’s hard to make a Vine video of something you normally do with two hands while having to film with one. Anyway, I also made a video with Instagram which was easier than Vine since you can important pre-recorded video. Either way, make sure you follow me on both Vine and Instagram if you have the apps so you don’t miss this stuff. I actually didn’t have Roll Into You in the set, but a couple of girls yelled for it so I threw it in. Hey, I aim to please. So, it was a good time. Eric Hutchinson put on a great show with hip tunes and has an awesome live band. Check him out if you haven’t yet. We had a chance to say hi to one another after a show and he was nice. I like it when the other act is nice, sometimes they’re not. yeah, I don’t know you, guy. Anyway, I’m back in Texas and ready to get back to work on a few projects, one of them being a new Five Times August album. Talk to you soon. This entry was posted in blog, music, touring, travel and tagged Five Times August, flying, performing, touring, travel. Bookmark the permalink.